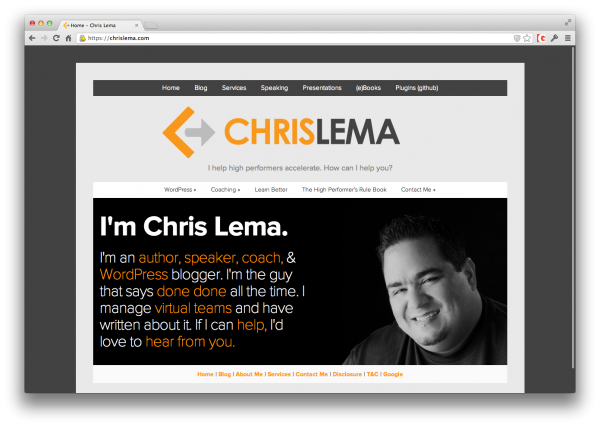 Chris Lema, pioneer of “done done” lets us pick his brain a bit with a few questions. He’s passionate about WordPress, developing business models (he could actually help you in this particular area), and is both an entrepreneur and leader within his own organization. In a nutshell, there’s a lot to learn from this cat, and we wanted to capture some time with him when we can (because he’s pretty busy). I’d been blogging using TypePad back in 2005 and heard about WordPress so I checked it out (early ’05). But I was still using a .NET CMS for side projects. Then I discovered WordPress supported “Pages” and could be used for web sites, not just blogs, and moved to it (mid-’05) and have been using it ever since. What Do You Feel the WP Community Needs Most and How Can We Fill That Need? Well I like to tell people that as rich and awesome as the WordPress community is, it’s still incredibly young. Some of the most well-known organizations in the community are only five years old. That’s really young. And if you speak with the leaders of these companies, you’ll discover many have grown and succeeded via the “trial and error” approach to what they’ve been doing. It’s awesome, but I think we can do much more for young leaders looking to create their next company in the community. I could go on about this all day. I love startups (started 3 of my own and worked in 2 others), and have a passion for the business side of things (except for accounting). That’s why I’ve been a huge proponent of adding a business track to WordCamps. This year Phoenix had one, San Diego has one, Miami has one and Reno has one. I’m sure others may too, but I don’t know about them. Anything You Would Like to See Implemented to WordPress as a Core Feature? Yes. When WYSIWYG first came out (yes, I’m officially old) it was a remarkable distinction from what had existed before and changed everything. But it feels like today we’re back to the pre-WYSIWYG days when I’m writing a post within WordPress. I would like the editor to leverage my site’s own CSS. I know, it’s crazy. But here’s the thing – my site has a specific column width with a specific font size, and styles for my headings. I would like to see that on my editing side because if not, I don’t know if my heading is going to wrap to two full lines, or just have one extra word hanging. I think it’s a problem worth solving. Pretend I’m a Newcomer to WP & Blogging – What is One Thing You Would Instill on Me? You don’t need a perfect site design. It will come over time and be influenced by the posts you write. Just start writing. The sooner you find your voice (and audience), the sooner you’ll be able to tweak your design. How in the World Do You Write So Many Blog Posts? Do You Ever Feel Burnt Out on Writing? I’m more of a public speaker than a writer. So when you read my stuff, hopefully you hear my voice – because I’m just writing what I would say to you if we were chatting. All that said, I started a reading discipline about 25 years ago (senior year in high school) to read for at least 15 minutes every single day. Some days it’s way more. Others it’s just 15 minutes. But I’ve been doing it consistently. Every day. Like others run. And so when I decided to start writing (a function of moving from the Silicon Valley to San Diego, not being known, and not having any speaking engagements), I started with a similar discipline. 30 minutes (at least) of writing every day. The truth is, if you’re not doing stuff – real stuff – then writing becomes it’s own end. I write to educate, to engage, and to influence. But it comes as a by-product of actually trying to get some things done. Outside of WordPress, What Do You Enjoy Doing? Well I do love reading. I also love vacations and eating at good restaurants. I coach entrepreneurs and I love the process of creating something from nothing. I’m creative in a non-artistic way. And I love cigars. By that I mean that I work to discover the talents and defaults of each person I interact with so I know how they move, then I look at the lay of the land to know what’s going on, and then I think a few steps ahead to best leverage the talents and players available to me. That’s why I’d put a big HC on my chest.